Low on space and want a really cute plant with pops of colour? The African Violet may be the one for you. I know, I know, you have seen them sitting on your grandmother’s window sill in her living room and kitchen for years. If Granny loves this plant, then so should you! African violets are a very low maintenance plant and will continue to provide long-lasting blooms with just a couple of simple steps. Water your African violet from the bottom of the plant when the top 1 inch of the soil is dry. Add a couple of inches of room temperature water into your kitchen sink and set your plant into it. Let it soak for about 25 minutes or so. If you water your plant from the top, you will get little brown spots all across the leaves. We love these new pots that have arrived that are specific for African violets. The plant is potted directly into the top piece and water is placed in the bottom of the pot. The clay base of the top piece is porous and will continually keep moisture in the plant. Similar to placing your plant on a pebbly tray with water to help with attracting humidity to your plants. African violets prefer a warm humid spot in bright, indirect sunlight. Make sure to shade your plant from direct sun as you will burn the leaves. With too much sun or dry air, the leaves may turn yellow. 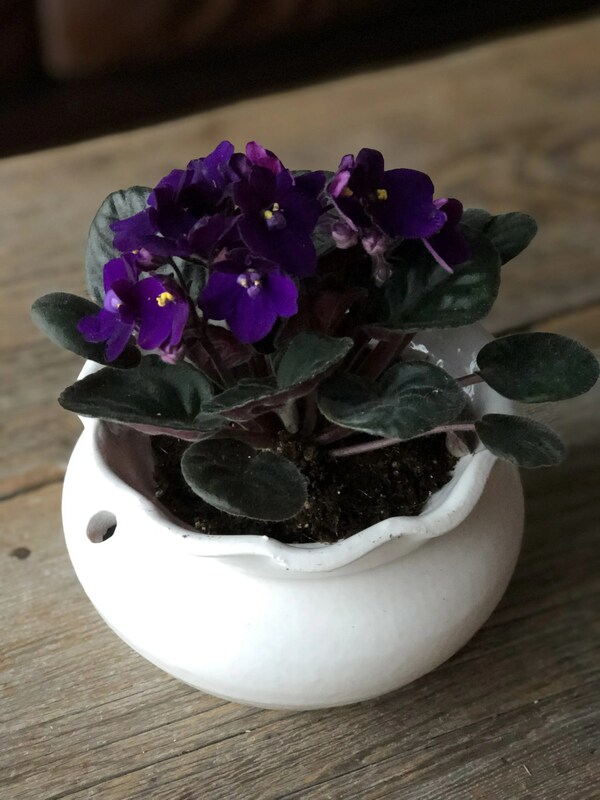 Do you have questions about African Violets? Drop them in the comments below and we will answer them!